"I believe the intellectual life of the whole of Western society is increasingly being split into two polar groups ..."
So wrote the British physicist and novelist C. P. Snow in his famous "The Two Cultures" Rede Lecture delivered at Cambridge University in 1959. Although Snow was mostly concerned with the divisions he felt between the "literary intellectuals" and "physical scientists" in his own personal and professional experience, the two-culture split has come to symbolize a wider gulf in academia between the sciences and the humanities. The split — and the strife it often generates — is palpable at most universities, and speaks directly to the heart of American schools, in particular, to their liberal arts curriculum and the (wrongly) widespread perception that in a world increasingly more technologically driven, the humanities are an anachronism. The 17th century marked a turning point in human intellectual history where what we now call "the sciences" started to carve their own path away from the Greek philosophical tradition. Kepler, Galileo, Descartes, Newton, Boyle, took off as natural philosophers — not just concerned with the workings of nature as their forefathers had been, but armed with a powerful new methodology whereby direct experimentation and data analysis were to describe a variety of natural phenomena, both terrestrial and heavenly, with mathematical precision. Their spectacular success changed the way people understood the cosmos and their place in it, creating, right or wrongly, a deep spiritual rift that has never been healed: If the human mind can understand the workings of the world without apparent limitations, what room then for mystery? For spiritual questioning? If the world is written in a mathematical code, what room then for doubt, for free will? Meanwhile, humanists and artists took off in opposing directions, asking questions this explosive new science couldn't address. What is the nature of physical reality? What is mind? Why am I who I am? How do we construct a sense of reality? What is justice? What is a good life? What is wisdom? Why exist? Is there purpose in the cosmos? As the centuries advanced, the two cultures moved farther away from one another, two bifurcating paths, creating their own language and methodology, their own academic values, their own questions to study. A liberal arts education was supposed to expose the students to both worlds without a serious attempt to explore their affinities or overlaps. It was enough to have students read Homer and Einstein, Milton and Newton, as disjoint efforts to explore the complexities of the world and of human nature. This era is now coming to an end. As we enter the 21st century, the barriers are crumbling. Essential questions about our humanity, even questions of meaning, once mostly the province of the humanities, are now part of scientific research. The nature of free will, the nature of reality, of consciousness, the future of humanity in an increasingly technological world, the hybridizing of human and machine, our future in space, our cosmic loneliness, the limits of scientific knowledge — to look at any of these questions from a one-sided perspective, either scientific or humanistic, is like looking through a window with the blinds down. We have the unprecedented opportunity to bring the sciences and the humanities back into constructive engagement, as complementary and interdependent facets of human knowledge. We now face questions which cannot be examined from a single perspective: We need both a scientific and a humanistic take on things in order to further our understanding. Take, for example, the nature of human consciousness. This has been a very old concern of philosophy and religion, the nature of mind. It is now a central question in cognitive neuroscience, and some brave intellectuals are treading paths on both fronts — as scientists and as humanists. Scientists tend to approach problems with brash enthusiasm and, often, with naïve expectations. They would do well to share the room with skeptical philosophers who ponder such questions in broader contexts. On the other hand, philosophers must be willing to partake in the amazing advances in neuro-scientific research, which is changing our understanding of the brain and its functioning. A common language needs to be developed and, more importantly, a recognition from both groups of the mutual advantages of sharing their knowledge. Take the nature of physical reality. Again, a question that dates back to the beginning of philosophy, as people wondered what is the material essence of the world — and whether we can know it. Of course, this is a central question of modern physics, in particular high energy physics, which seeks to determine the fundamental components of physical reality, the particles that make up everything that exists. 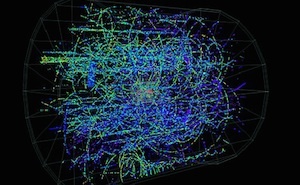 As physicists made progress discovering particles like the electron, the quark and the Higgs boson, they also realized that the theory they use to describe such entities, quantum physics, presents deep challenges of interpretation. We don't know how to reconcile quantum physics with the theory describing the physics of space and time, general relativity. This creates an acute problem as we ask questions related to the origin of the universe or the nature of physical reality. Can science describe what happened as the universe emerged in the Big Bang 13.8 billion years ago? Is "emerge" even the correct word? Can science describe the ultimate essence of physical reality given the inherent uncertainty of quantum physics? Can human knowledge go that far? Or are we bound within an island of knowledge surrounded by inscrutable unknowns? Even the future of our humanity is at stake, as we move toward a more thorough hybridization with machines. We define ourselves through our cell phones and think of scenarios where we will be different, part human part machine, with some scientists even speculating that a singularity point will be reached when machines will become smarter than we are. Such technological advances call into question the wisdom of our scientific advances, raising issues related to machine control and the ethical manipulation of humans. Questions such as these, and many others (for a wide sample, go here, are essential to both scientific and humanistic research, having broad social implications. To a large extent, they are at the core of a liberal arts curriculum, as students and academics tackle what can be called the "big questions." They go alongside more practical concerns, of course — and also for these a joint effort, a complementary approach between disciplines, is essential. There is a new culture emerging, badly needed as we face questions that may have old origins but that remain at the very core of our pursuit of knowledge. The choices we make now, as we shape our curricula and create academic departments and divisions, will shape the minds of future generations and of intellectual cooperation. Newer:How Does Molecular Action in the Brain Make Thoughts?Older:Is Running Good or Bad for Your Health?